The China House Vision is an architectural exhibition that images in the future of urban living for Beijing Design Week 2018. On view through November 4 at the Herzog and de Meuron–designed stadium in Beijing’s Olympic Park, the exhibit includes the work of ten internationally acclaimed designers whose work has been heavily influenced by topics concerning communication, energy consumption, artificial intelligence, and the sharing economy. 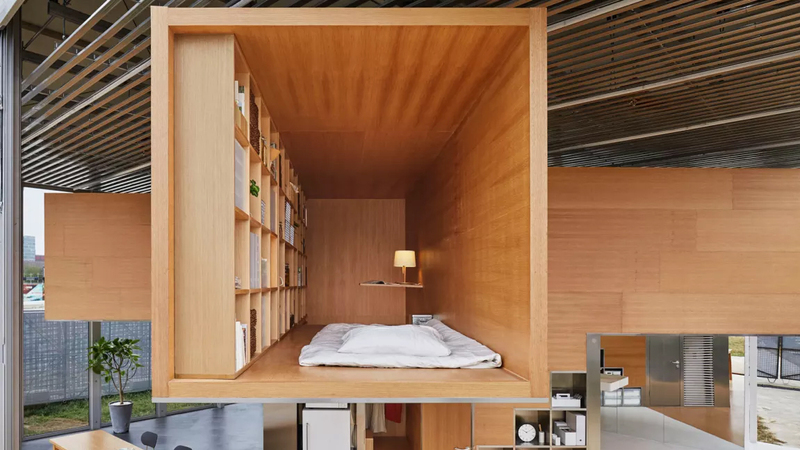 Among the “dwellings of the future” is a prototypical living space for MUJI employees, the result of the collaborative work between MUJI, a Japanese retail company distinguished for its emphasis on minimalism and environmental design, and Japanese architect Go Hasegawa. 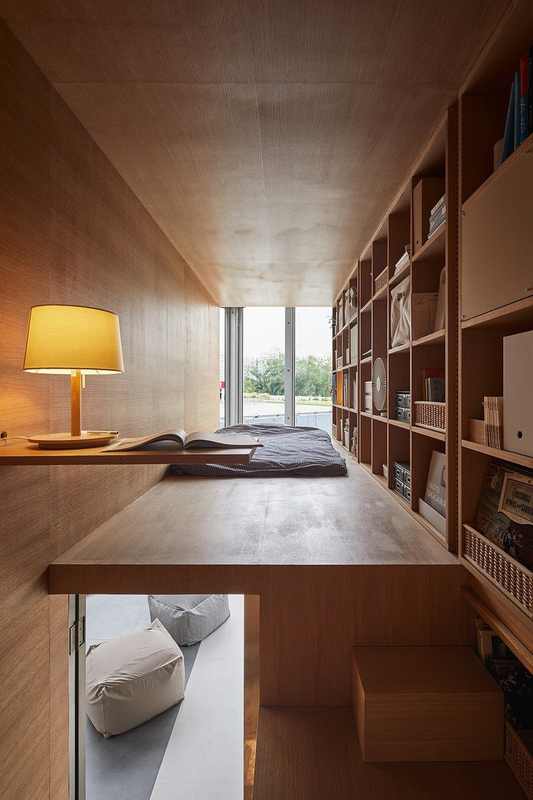 MUJI gained inspiration for the project from the top floors of residential buildings in Shanghai, where 13-foot-tall spaces are taller than single-story dwellings require, yet too small for duplex apartments. 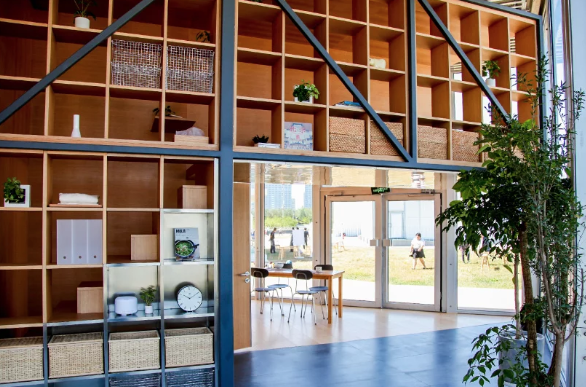 MUJI sought to transform an awkward and uncooperative space in the stadium into a jungle of micro-apartments, particularly for staff members working at MUJI. The scheme, like MUJI, is both modern and minimalist with its use of fine lines, pure geometry, and colorless walls and ceilings. However, it also evokes historic sentiments through its use of a centrally positioned, three-dimensional unit reminiscent of the “canopy beds” found in traditional Chinese dwellings. The central unit, along with a series of thin wooden partitions, divides the various shared and private compartments of the home. A modest staircase leads to the private bedrooms, which are both austere and claustrophobic, each containing only built-in storage racks and a small bed. The lower level of the scheme functions as a shared space with an open and flexible floor plan. Shared household appliances such as air conditioning units, refrigerators, and washing machines are strategically and efficiently built into the walls of the compound. MUJI’s “no-frills” furniture is found throughout the scheme, adding to the dwelling’s already minimalist aesthetic. 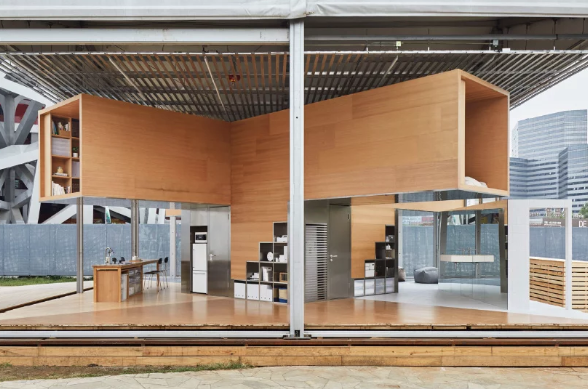 Through the scheme’s disentangled layout, colorless scenery, and placid décor, Go Hasegawa’s prototypical dwelling of the future presents viewers with a glimpse of what it is like to live in an environment where hyper-functionalism and shared resources are commonplace.